I've always been partially afraid of heights, but this past day I came to realize that I was more scared than I thought. This was the day that I climbed up the mast. We rigged a harness, used the little hand/footholds fastened to the side of the mast, and up I went. We fashioned the harness ourselves. It was a made out of a piece of webbing, a one inch wide piece of nylon. 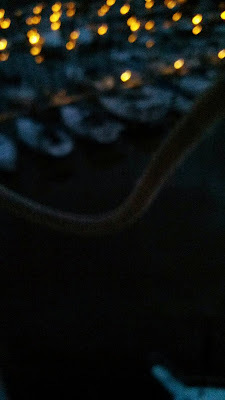 It was looped and tied in such a way that it pulled on my thighs and dug into my back. Basically, it hurt a lot. 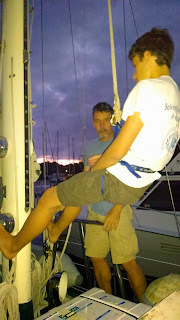 To haul me up, we attached the harness to the spinnaker halyard (the rope that raises the sail called a spinnaker). My dad didn't trust the shackle on the halyard, so he lashed the rope directly to the harness. To test it, I swung around on it and hung upside down. My dad was there to hold me up there in case I fell. 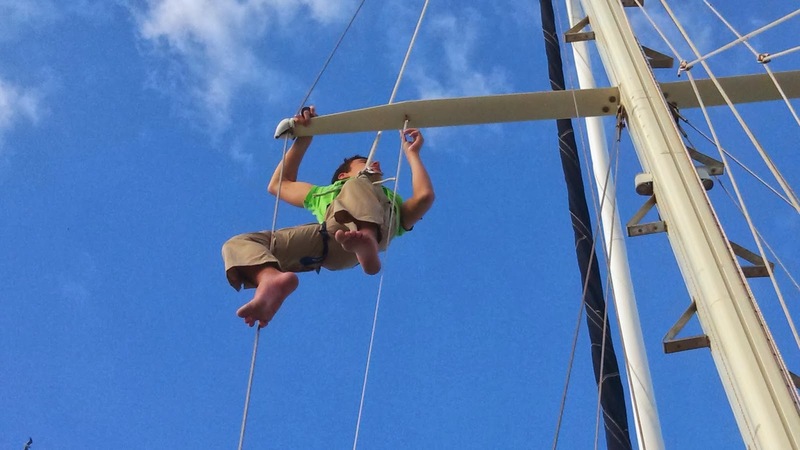 He held the spinnaker halyard around a winch and took up slack. I was ready to climb. I started the ascent, slightly nervous, but excited. It was mostly straightforward, hand over hand and foot over foot. It was still scary to look down, though, and I was only halfway up. There were two hiccups in the climbing of the mast, and those were the spreaders and the staysail. 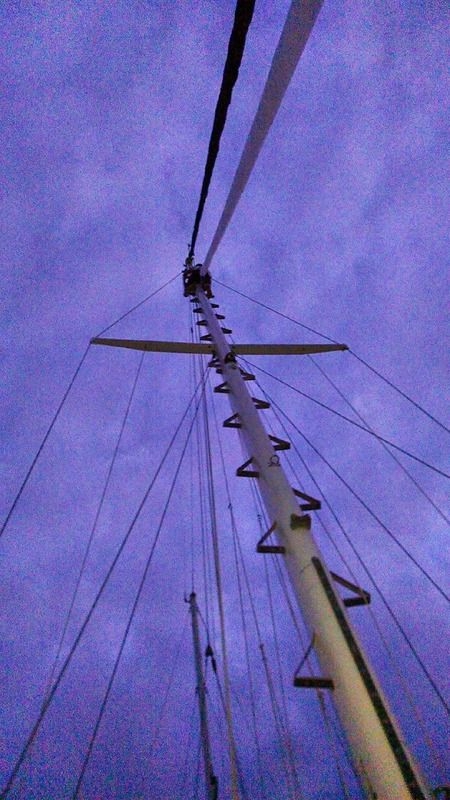 The spreaders are the poles that stick out of the side of the mast, about halfway up. Getting past them was a problem because there wasn't another hand/foot hold until after the spreaders. I had to pull myself up the mast, one foot hanging loosely. That might not seem that bad, but when you can see the deck far below you, it's slightly nerve-wracking. The next problem was the staysail. The staysail is a sail that comes diagonally into the mast three fourths of the way up. Because I was attached to a line that was on the port side of the pole, I had to climb past it using the holds on one side. After dealing with the staysail, I got to the top without a hitch, apart from the occasional glance down followed by the thought, "Oh crap, I'm really high." I had made it to the top safely. The view was great, but I was still terrified. I wrapped my left arm around the mainmast and grabbed the opposite hand hold. 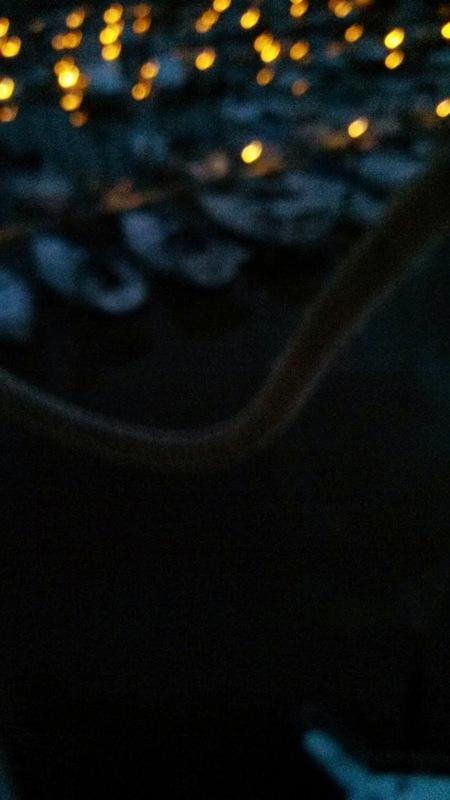 I used my free hand to take out my phone (which was tethered to my harness) and snapped two photos. My hands and arms were shaking tremendously, and the adrenaline and fear were coursing through my body. 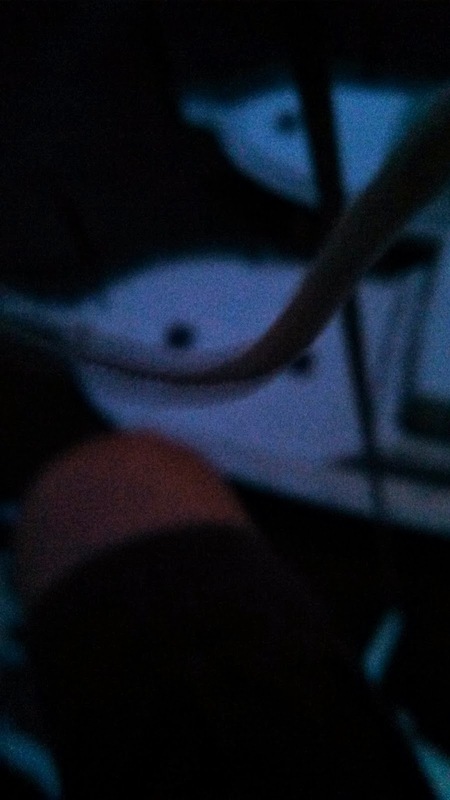 I couldn't even feel the harness digging in to my legs, and only realized upon reflection that it hurt. It had been getting darker and darker as I climbed, and once I was at the top, it was night. After I took the pictures, I was overcome with fear and the urge to get off the mast, so I started my descent. Strangely, when I was passing by the staysail, my cling-to-the-mast feeling was replaced by a feeling of confidence, the fear suddenly disappearing. I got past the staysail by using only my hands to lower myself down. By the time I got to the spreaders, I was back to my freaked-out self. Soon I was back on solid ground (but not actually so solid; it was rocking). I was relieved to be down, but part of me wanted to go back up. I'm sure I wouldn't have thought that at the top of the mast, though. With a feeling of self accomplishment for beating my fear, I headed below. Less than a week later, I went up again. There was work to be done. The cover at the tip of the port spreader was coming off, and a flag halyard block (pulley) under the spreader was jammed. 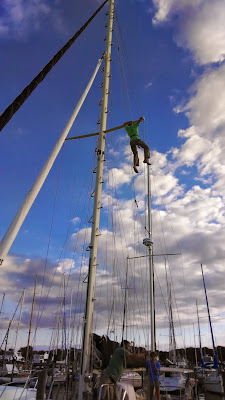 To get to the cover, I had to hang out away from the mast. I was very nervous at first, to be hanging there without any foothold whatsoever. I grabbed on tight to the spreader, which was above my head, and hung by the mast for a second, my heart beating hard. I inched out along the spreader. I almost got to the end, when there was a great pain in my leg. It hurt so much that I ignored my fear and yanked myself quickly back to the mast. When I got my footholds back, I examined it. It seemed that the strap was pressing on a tendon. The harness hurt much more than the first time I climbed the mast, because I was hanging there, and the harness was more than a last resort. I adjusted it a bit, and headed back out the spreader. The adrenaline was helping, so it hurt less, and I just ignored the pain. Feeling slightly better about what I was doing, I went out and examined the spreader covering. I needed to tape it back on in three places: around the spreader and on the shroud below and above the spreader. I got the tape out of my pocket, but needed two hands to loosen the end. 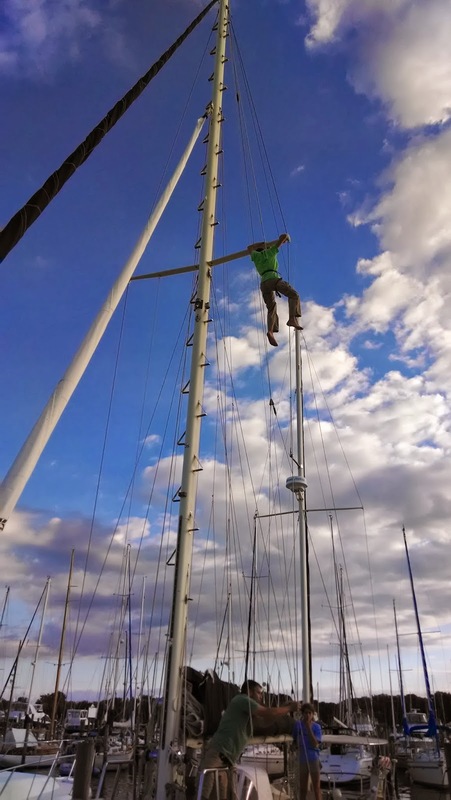 I headed back to the mast and once I was set, used both hands to loosen the end of the tape. Keeping the roll on my middle finger, I pulled myself back out, used my teeth to pull the end out a bit more, and tried to tape the cover with one hand. It didn't work. As I went back to the mast to rethink my strategy, I took a look at the other project - the block. It is a pulley positioned in the middle of the spreader with a line that goes down to the deck, and it wasn't working. We needed a new one, so I had to take it off by taking out a pin, held on with a cotter ring, which is similar to a key ring. To take it off while still holding the block and have it not fall and hit my dad on the head, I needed two hands. I couldn't use two hands in my current position, because one was holding the spreader, preventing me from swinging back and hitting the mast. I went back to the mast and climbed up a bit more. My dad secured the belay again, and I could then put both arms on top of the spreader at the armpits and pull myself out. This allowed me to grab the block on the bottom of the spreader with both hands and hold it. There was one problem: I couldn't see the cotter ring, so it was very hard to take it off. Key rings are hard enough to take off even when you're looking at them. 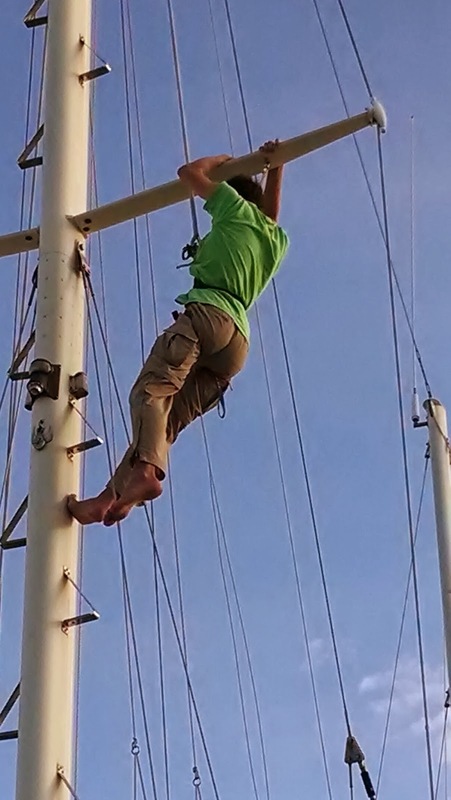 I went back to the mast and lowered myself down again, so I could use my one free hand to get one end of the cotter ring on the outside of the hole. I then raised myself up again so I could use both hands. (All this 35 feet above the deck.) I carefully pocketed the pin and ring and dropped the block into the water (it was still attached to the line on the boat), so it didn't hurt anything. One task down, and one to go! Now that I was higher up and my left arm could wrap around the spreader and still reach the cover, my job was easy. 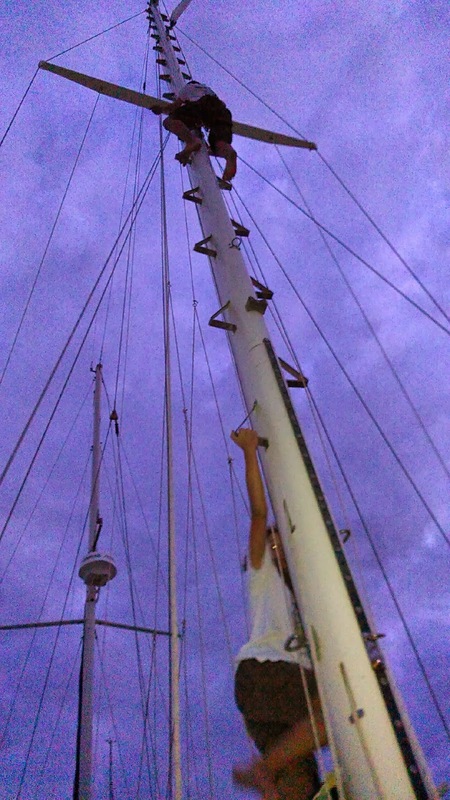 I taped the three places up as tightly as I could, and swung back to the mast for the last time, a job well done. By then I was having lots of fun, ignoring the pain, and sad to end it. After a short climb down, I rested my legs, in a large amount of pain now that the adrenaline had worn off. We then researched a new harness design that doesn't hurt. 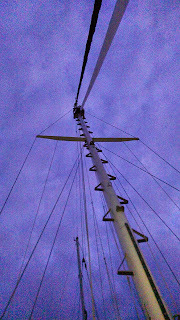 Climbing the mast was a great experience, after I got over the fear. It was still fun during the times of immense fear, on reflection, but at the time I was to scared to experience it. Halfway through the second climb, I just lost all fear whatsoever and had a great time. And afterwards, I felt good about conquering my terror. This was a huge amount of fun, and I'd do it again in a heartbeat. In fact, I've already asked my dad if there's any more work to be done up there. Hanging from the spreader. Look how high it is! Quite a feat, Cash. A character in the book I'm reading said you can only be brave if you are afraid. I was quite nervous at the beginning of your account of your tasks, but I felt so much better and relieved, actually, when you overcame some fear and felt the sense of accomplishment. What an awesome lesson. Plus, you and Nicole both show a lot of patience, thoughtfulness, and care. Can't wait for the next installment!